How can people and plants work together to improve air quality, as well as mental and physical health in the city? In this talk we will hear from researchers and practitioners who have been exploring citizen sensing and ‘phyto-sensing’ as strategies for gathering data on pollution and health in the city. How might these innovative methodologies, which combine art, science, sociology and design lead to new ways of understanding and acting on the urgent environmental and social challenges we currently face? Jennifer Gabrys is Principal Investigator on Citizen Sense and AirKit, two projects funded by the European Research Council. Her research investigates environments, digital technologies and citizen participation through theoretical and practice-based work. She recently developed the Phyto-sensor toolkit in collaboration with the Museum of London, where she also helped to establish temporary clean air gardens as part of the City of London’s Low Emission Neighbourhood project funded by the Mayor of London. Michael Smythe is director of Nomad Projects and co-producer of the Phytology medicinal meadow at Bethnal Green Nature Reserve. 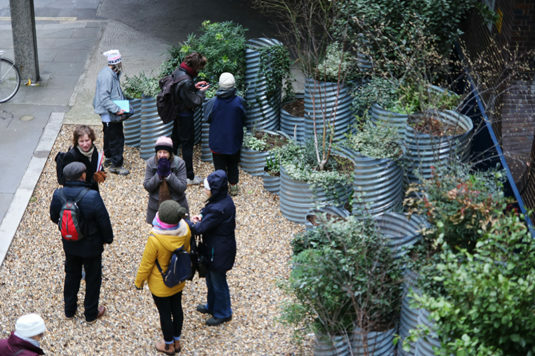 He has recently collaborated with Kings College London and J&L Gibbons Landscape Architects to produce Urban Mind, a citizen science project which seeks to understand how urban living affects mental wellbeing. As Living Lab Coordinator at the Calthorpe Project, Rokiah oversees the construction and operation of various elements of the closed-loop model being demonstrated there, including the anaerobic digester, vermifilter, and hydroponics systems. The model aims to transform foodwaste into renewable energy and fertiliser, as well as reduce carbon and methane emmissions and improve air quality. Rokiah uses citizen science strategies to develop skills and understandings of the circular approach to managing organic resources in the city. Tickets – Book your place here!